Snappii diligently develops mobile solutions to improve service companies operations. Being one of the Top 20 is an outstanding accomplishment and a great step for Snappii. 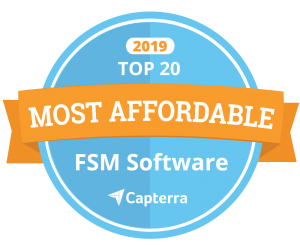 Snappii, a leading Mobile Business Apps and Mobile Forms company for various field service businesses, announced today that it has been named a Top 20 Most Affordable Field Service Management Software product by Capterra, a leading online resource that helps organizations find the right software. Top 20 Most Affordable Field Service Management Software is an independent assessment that evaluates the standard features offered by a product, cost of these features, and customer reviews on feature fit, value and quality. Top 20 Most Affordable Field Service Management Software is available here. Plumbers, electricians, HVAC, elevator repair, fire suppression, vehicle inspection and maintenance, oilfield drilling, equipment installation, cleaning inspection and other field service companies value time and efficiency. Their multitasking requires an appropriate software. Snappii has multifunctional apps for a plenty of field service operations in the Apple and Google Stores, and is working hard for their improvement, as well as adding new apps. Snappii apps for field service management help better organize working process, track time spent on a job, improve documentation and reporting, and stay on time and on budget. Snappii is the only software provider that enables companies utilize their existing Forms and PDFs and quickly convert to or add them to any Mobile App. This accelerates conversion of paper to digital format and significantly reduces the cost of going paperless. Another unique capability of Snappii is the ability to quickly customize any App specifically to the customers’ requirements. Forms, workflow, appearance, logo, UI, anything that a customer wants to customize can be customized. The end product is designed to fit specific customers’ needs and this helps with organizational adoption. Below are the most popular Snappii field service apps. Job Estimate and Repair Order mobile app is a perfect pocket tool to provide detailed information about projects and work completed by service organizations. It keeps track of basic data, specific details of the job and its progress statuses by creating estimates to completion reports. Users are able to calculate total cost in labor, parts, and the grand totals of the estimates and reports, inform and agree upon the changes made to the project, sync collected data across multiple devices, work online/offline and more. Anyone can create daily log reports right in the field with Field Service Daily Log app. Users are able to fill in all necessary details including specific contact details, locations, add and mark up photos, signatures and more. Moreover, Field Service Daily Log app is a powerful reporting tool, which helps employees instantly create reports on mobile devices and send them to managers. Work Order Assigner app is specifically designed for managers and in-field personnel to create tasks and assign them to particular employees, provide details and time frames as well as site locations. Employees can check tasks and notify managers when complete them. Managers easily collect all necessary data, generate reports and share them. The app allows users to improve and optimize the whole workflow. Inspections are an integral process of any field service company. Snappii offers Inspect Anything app to accelerate and streamline this process. The app allows users to replace paperwork and quickly collect data on move using just a smartphone. In addition to data collection, Inspect Anything app users can create full-length reports with photos, drawings, QR codes, barcodes, and locations. All data are safely stored locally on the device and available for sharing or printing. Moreover, Snappii provides specific apps for particular occupations and activities. For example, Estimate Plumbing app, HVAC Inspection Checklist app, Cleaning Inspection Checklist with Tasks app, etc. All these field service apps are available for free download from Apple and Google Play Stores and can be 100% customized to meet specific needs of any organization. Field service industry actively masters the use of mobile solutions. Thanks to modern field service management software, modern companies have real-time, everywhere communication, fast and convenient work with current data and optimized workflow and customer service. Snappii is proud to be a part of this and listed in the Top 20 Most Affordable Field Service Management Software. This entry was posted in Press releases and tagged Mobile Apps, Mobile forms, field service, mobile app development, software by Alex Bakman. Bookmark the permalink.